Hi there, I'm the owner of a 1973 2.0 liter which was given to me by my father, the original owner. The car is Saturn Yellow all original. It has probably 230K miles and the motor has been rebuilt with euro spec parts. I have done a comprehensive inventory f the car and it needs the brakes rebuilt, suspension re done and a few other things. I'm planning on replacing the plastic fuel lines and new shifter bushings. I'm looking for advice on rebuilding the front suspension. Is it considered taboo to use poly bronze bushings, turbo tie rod ends and Koni shocks in the rebuild, respective to originality? My goal is to make the car a fun driver that I can take to the occasional auto cross and back road burner. Do want you want. Save all the old parts. Everything can be turned back if you change your mind. Glad to hear that you're keeping your Dad's car in the family & original - it looks like a nice survivor for sure! Try to not do anything non-reversible, with a survivor like that though. I see you have Rich Bontempi's plate frames on the car, so he can help you with suggestions for performance, handling, etc. - as both a great 914 mechanic & former 914 racer. There are a bunch of other 914world members up in the Bay Area too, who can help with your question. Shocks/Struts are replacement/wear items, & it was common to put in better ones when the time came - as I did on my rolling resto/mech-rebuild in 1980-83 when I put in Koni Reds on all 4 corners. So they wouldn't be an originality problem. You'll need the front struts which are made to fit the front struts on your car - which were mostly Boge type from the factory, & they make both Koni & Bilstein inserts to fit in them (as well as Boge) - unless your Dad ordered or got the optional Koni or Bilstein struts - in which case you'll need to stick with either of those brands respectively. Again, check with Rich. Personally, I preferred the overall handling of the old school Koni Reds which I got, over the Bilsteins or stock Boges, after driving friends' 914s with Koni & Bilstein shocks/struts, as well as to the original Boges on mine since I bought it from the OO in `75 (I'll have Koni restore mine for my current resto). Nor would turbo-tie-rods as wear items/upgrades be an originality problem, which I too will be doing for my resto coming up too. You may want to add a bump-steer kit if you notice that problem driving it after the suspension renovation, but I'd wait to try it out first without the kit (mine wasn't a problem before nor after). However, I would reconsider the poly-bronze bushings though, because I think that will give you too harsh of a ride for all other uses not at AX/Track times. There are good poly street & race/AX poly bushings out there, so check with Rich at HPH for his reccos. The race ones will be much stiffer & give you somewhat harsher street ride - so you may not want to go to them for regular driving comfort (especially if you plan to bring wife/GF/SO, kids, other non-racer friends, etc. along for the street rides. The tires also play an important part in the 914's suspension & driving habits, so you may want to stick with stock-ish tire sizes of 165HR15 (165/80R15) or 185/70HR15 (TR & VR speed ratings also work for a 2.0 /4) - both to keep a comfortable ride for others - if not yourself, as well as to avoid adding odometer error "ghost mileage" to your 914 (as well as speedo error for cops), as happens with other sizes like 195/65R15 etc. Then get another set of 4 light wheels & high performance tires of your choice which will fit & not rub in lock-to-lock steering/etc. for AX/Track purposes - especially since you'll wear through tires faster doing that. In all cases, use a tire size calculator to compare other tire sizes with the stock 165/80R15 on 914s in order to minimize your speedo error to <1% or so, to avoid adding non-existent miles to the car - even when doing AX/Track events. Back in my 1980-83 rolling resto/rebuild i had all 4 corners of the suspension redone with the Konis, but I stuck with factory bushings which were still available back then in street or "performance" flavors & IIRC we went with the perf. ones - but then it ws my DD & I never AXed in it, but did do some fun/hard twisties driving..
Additionally, it looks like your front suspension is still a bit higher that Euro spec, so you can vastly improve balance & handling by dropping it another 1/2" - 1" or so - again ask Rich to adjust the front torsion bars to drop it, or show you how. The past engine rebuild to the Euro spec 8:1 CR P&Cs for 100 HP was common - especially after CA passed the older classics smog exemption (& before in the other 49 states), so that's not an issue in most cases either, especially if it were rebuilt with a Porsche P&C kit/parts. I may do mine that way if it ever needs another engine rebuild (mine was rebuilt in 83 to stock (well, honed with a tad more cc's), but only had +/- 20K miles on it when it got whacked while parked in a parking structure in 85 - so it's just going to get "recommissioned" & cleaned up for this resto). If the interior upholstery/carpet & paint are all original - or at least 75% or more original - then I'd advise trying to do whatever you can to keep it that way, & restore the paint finish yourself or with a concours paint pro (check around with your PCA Region/Zone Concours folks for reccos on that). It looks like the front lid may have some oxidation & maybe the rear lids too - so try to have them carefully take out the oxidation so it will match closer to the less exposed side panels/etc. They can also touch-up the paint chips around the wheels wells, door(s), etc. - without going into non-original paint status. A well refurbished original paint & interior will both retain more value, & qualify the car for Preservation Class in the PCA & other Concours events (even if you don't do them). But if it's been resprayed already in it's lifetime, then you're free to repaint if/as needed, but keep the original factory delivered color. Tom T. Thanks for the input. You noticed the front hood. My brother drove the car when he was in college. Someone backed into it and dented the hood. When they resprayed it, the rest of the paint was faded and the autobody guys matched the hood to the faded paint. So that will need a re-spray. All the other paint is original and I want to keep it as original as possible. It has polished out quite nice. The pics are when I first got it. It looks much better now. I know Rich is a great resource and will get to him at some point. I do have good mechanical ability and already lowered the front a bit. But the rear springs have sagged. Hence the need to do a rebuild. The interior is in fantastic shape. Original carpet, one small hole in the driver's bolster original radio. My kid brother installed a clifford alarm and put the stupid light in the middle of the dash. I do need to reskin the steering wheel. I really appreciate the input. I'm hoping for a warm spring so that I can get a bunch of stuff done. I think that you can squeak by at 75% with one of a any resprayed lid or door. You basically will get a pass in most cases for chip repairs & touch-ups. BTW, that's a PCA rule for originality to compete in most Zone/Region & National Parade Concours as preservation class (or similar names) only. Other concours, potential future buyers, appraisers, insurance companies, etc. may have other ideas - but you can still point to PCA Concours Rules for support. Likewise, you can fix the bolster hole with new leatherette - either get a yard or so of smooth leatherette from Autos International in Escondido CA & have a good local Porsche upholstery shop redo just that bolster (check if the local shop as a good match for the leatherette themselves first); or else take/ship the seat to AI to redo it. I'd bet it's the driver's outer lower bolster where we all drag our butts, wallets & pocket junk across it! You can also get the dash face leatherette material to either repair of reface the whole area where your brother put the light/alarm. AI, Dallas Steering Wheel & another SoCal shop whose name escapes me now all do excellent recovering. If you find a good Bay Area Porsche upholstery resto shop to do your bolster, then they may also do the wheel properly too, but go to a local PCA Concours to ask the 356 & 911/912 guys where they go. But make sure that they use real leather with a similar grain as the original, & adding an extra felt pad under it is usually okay too (70-73 914's had real leather wrapped wheels & shifter boots, 74-76 went to leatherette). I had a local custom upholstery shop redo my 85 E30 BMW's wheel & front seats in a dead on match - so it's possible to find locals. All of those interior fixes won't get you past 90% original, I wouldn't think. I think that you can still go down another 1/2" to 1" +/- in front, if you look at the pick of my messy 914 below, which was lowered by my longtime 914 mechanic since when I was looking for one in 1975 - & Hans was factory trained on 914s from 1969> & worked as Circle Porsche's 914 guy until he opened his own shop in 1972. Usually sagging rear springs won't pull the front up so much, as does the actual setting. Rather, it'll just look higher in relation to the lower rear with a sag. The test is relative to the fender lip alignment to the adjacent tire sidewall to tell where you're at. When you get it down as low as mine, then you're at a perfect 50:50 weight distribution, & the car leads you into the turns - you almost just have to think about turning, & you're going that way! > Note than mine is riding perhaps a 1/2" to 1" higher in the pix above, than when it has the bumper/etc. on, spare & tire board in, full tank of gas, etc. - so the above pix are still showing it a bit higher than optimal when fully loaded for the road. Yours is still a bit higher than that. The factory set them extra high for US-DOT standards of where the front bumper was supposed to be, which IIRC was aboout 2.5" higher than in RoW delivery 914s. Here's a better pic of my buddy's 61K mile original owner survivor `71 914/4 (1.7L) in approximately the same position as yours, with his front end also set-up lower by Hans, with yours below it for comparison. PS - his rear isn't sagging with only 61K miles on it, the springs are like new, as is the paint, interior, etc. BTW - Original `73 2.0 rear springs were 90 lb. IIRC, so you might check with Rich if he has any lightly used or NOS factory ones - otherwise try not to go more than 100 lbs., because much more makes 914s run hard/harsh for street use & on long trips IMHO. You may just want to do a PCA driving tours, California 1000 or some touring like that, & those seats don't have a lot of padding - so you won't want too hard on the rear springs, nor with suspension bushings F & R, etc.! 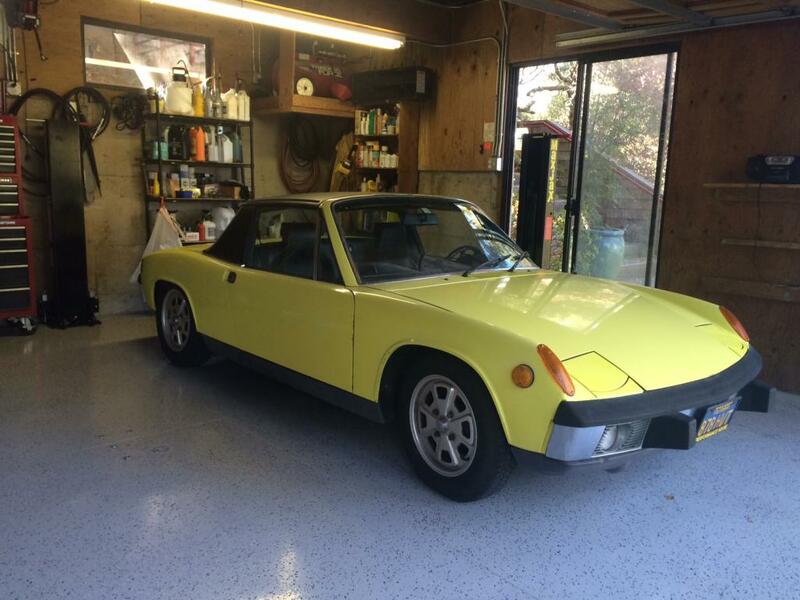 Also, it sounds like your Dad's 914 has both the Appearance & Performance Groups of options, so may have been one of the ones marketed under the "914S" Trim Package here in the USA up until sometime in Spring of `73. I don't know when it's VIN ....18849 fell in the year, but you can decode the Chassis No. for a build date using the formula below the 914S Advert pic. I'll have to check yours out the next time I get to the Bay Area!